There are many software packages which will stitch photos together and blend them. You do need to check the results carefully as although they do a good job it is never perfect and they may need further manual intervention retouching here and there. Remember to zoom in and check! ﻿So how do you go about doing this? Well you need to decide that you are going to make a panoramic canvas print in the first place. It requires some planning and as landscapes are the most common panoramas I will stick with this. Check the weather. There is no point in heaving all your kit up a hill to get that brilliant view if the clouds are preventing you from seeing it! Try to work out when you want to take the shot? Is it a sunset or during the day or bright and sunny or cloudy and moody? What are you trying to make the people looking at it feel? Once you have decided, get yourself in the right position for the best composure and use a tripod. Detail is everything in a panoramic print and if you are wobbling around trying to hold the camera steady then do not be surprised if the result is blurry. Try and keep the camera level with any horizons and when you are moving it keep it roughly in the same place. Mark out where you want the panorama to start and finish and add a little extra to either side – you can always crop this off but you can’t add it in if it’s not there in the first place. Set the camera to manual focussing and turn off auto balance. It is just about impossible to join images together if the focal range changes from a nearby hill to a far away mountain. The same applies with colour balance. A little bit more sky in the shot and suddenly the white point shifts and the hills darken down. Keep the exposure consistent – read your camera manual as they are all different for achieving this. Once the camera is lined up and set up. Wait for the moment to be correct and start with the first photo. Then move the camera on the tripod and take the next and so on. Allow at least a third of the image to overlap to help with the stitching. You may get away with less but it always helps to have a little more. A good overlap will help keep the colour consistent and also allow more accuracy lining the image up with the joins. It is important to try and get this done as quickly as possible as the last thing you want is the colours changing with different lighting (clouds etc.). As clouds also move you must try to do this quickly otherwise your end panorama will look odd with strange shaped clouds. Repeat the procedure if necessary – it doesn’t take long to do once you are in position and set up but it will take a lot a more effort to walk all the way back up the mountain to get the same shot if the first set of photos are not to your liking. I know a photographer using 120 roll film (6cm x 14cm transparencies) to take panoramic photos. He carries two cameras and a tripod to get the shots he wants – one camera for light meter readings and the second takes the shot. He has to wait until the lab processes the film to see if it has worked or not and if it doesn’t then it is start at the beginning again. Once you have your images and have stitched them together. Check it over carefully retouching as necessary. Look for bad joins, sharp edges and colour variations. Apply some unsharp mask to help lift out the detail – not too much that it will look fake. Remember that canvas prints have a slight texture which helps to mask any slight imperfections. 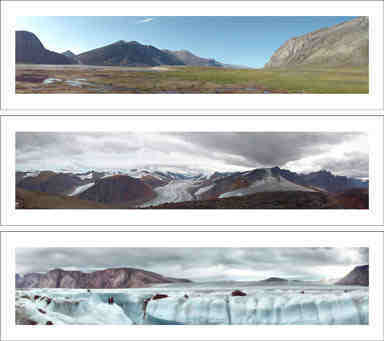 Your panoramic canvas prints should now be ready for printing.